In November, SMPL Design Studio began installation of its latest prefab project in Yellowknife, Northwest Territories. It was -16° C out, and workers had to crane into place four modules for the YK Duplex 2. Had this been a traditional construction project though, workers would have been out in the cold for months rather than a couple days. The project was recently finished and boasts a super-insulated wall assembly, triple-paned windows and a rooftop solar system, all of which earned it a score of 82 through Canada's EnerGuide rating system. 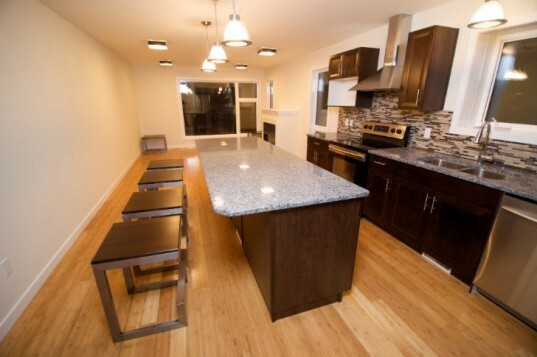 The YK Duplex 2 was constructed at SMPLy Mod Prefab Homes‘ factories, which are located north of Edmonton, Alberta. Design was handled by their sister company SMPL Design Studio and developed by ModHome. The four modules were constructed inside in a controlled climate before being trucked to Yellowknife where they were installed in below freezing conditions. Prefab construction allows homes to be well-built in harsh climates by reducing time spent outdoors. After the four modules were installed, finishing crews were inside working to complete the interior. The duplex features 2 homes, each 1,200 sq ft with 2 bedrooms and 2 bathrooms. 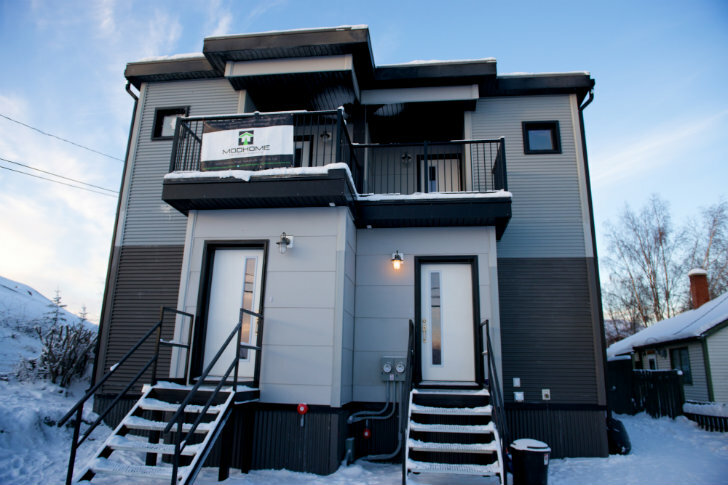 Like their other prefab home, this duplex is energy efficient and achieved a score of 82 through Canada’s EnerGuide rating system, which helps the homeowners reduce their utility bills for a reduction of 40-55% compared to other homes. The homes are powered in part by a 2.6 kw solar system on the roof and makes use of a 95.4% efficient propane furnace, on demand gas hot water heaters and heat recovery ventilators. The exterior is finished with zero maintenance materials and the floors are sustainably grown, harvested and manufactured bamboo. The YK Duplex 2 was constructed by SMPLy Mod Prefab Homes in their factories North of Edmonton, Alberta. Design was handled by their sister company SMPL Design Studio and developed by ModHome. The four modules were constructed inside in a controlled climate before being trucked to Yellowknife where they were installed in below freezing conditions. Prefab construction allows homes to be well-built in harsh climates by reducing time spent outdoors. After the four modules were installed, finishing crews were inside working to complete the interior. The duplex features 2 homes, each 1,200 sq ft with 2 bedrooms and 2 bathrooms. Like their other prefab home, this duplex is energy efficient and achieved a score of 82 through Canada's EnerGuide rating system, which helps the homeowners reduce their utility bills for a reduction of 40-55% compared to other homes. The homes are powered in part by a 2.6 kw solar system on the roof and makes use of a 95.4% efficient propane furnace, on demand gas hot water heaters and heat recovery ventilators. The exterior is finished with zero maintenance materials and the floors are sustainably grown, harvested and manufactured bamboo. The kitchen leads to an upstairs deck. Kitchen and open floor plan living room. Stairs leading down to the bedrooms.